True Surround Sound from a Single Unit Beautifully designed with 44 precisely calculated and positioned beam drivers and two woofers, the YSP-5600 effectively creates 7-channel sound beams (front left/right, center, surround left/right, height left/right). Using Yamaha Digital Sound Projector technology, each speaker is controlled by individual delay times and is driven with its own independent amplifier circuit. These beams are projected onto the walls and ceiling, and reflected to the listening position. In addition, the YSP-5600 uses the surround channel sound beam for surround back to support 7.1.2-channel Dolby Atmos or DTS:X reproduction. 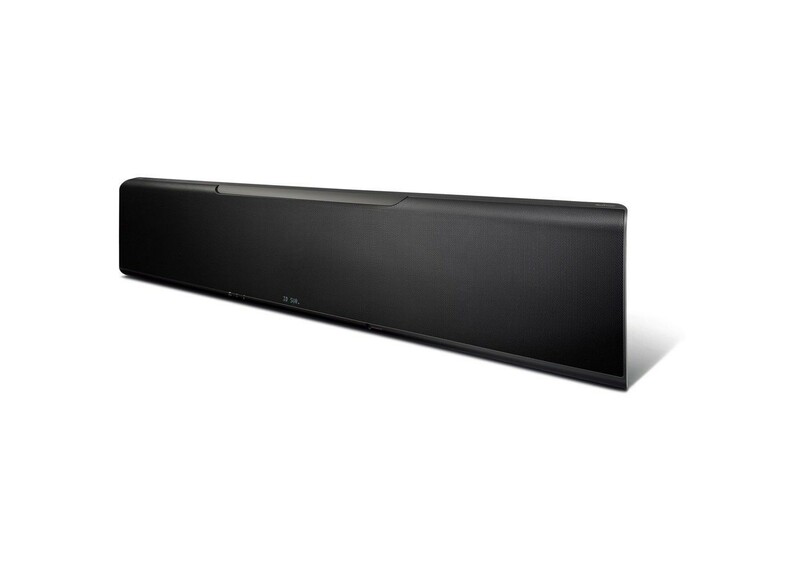 The First Sound Bar to Create Height Channels The height channels are created by placing six array speakers on each end of the unit (a total of 12). For the maximum sound beam effect, they are mounted on an angled baffle with sound beam vertical control. The result is realistic sound field reproduction with true height, as if real speakers were mounted on the ceiling. You get great sound without having to mount ceiling speakers or run speaker wire. Height Channel Positions Can Be Precisely Adjusted to Match the Listening Position For reproduction of the latest surround sound formats such as Dolby Atmos and DTS:X, the relationship between the listening position and the height channel is critical for the best sound. The YSP-5600 adjusts the angle of the sound beam directed at the ceiling allowing the height channel position to match the listening position. This process can be done manually or automatically. Directed Sound Beams Realize Distinct Height Channel Audio The height speakers create multi-dimensional sound by reflecting directed beams off the ceiling to the listening position. The YSP-5600 creates accurate sound position, ensuring realistic reproduction of overhead sound effects such as thunder or airplanes. Dialogue Lift Ensures Proper Dialogue Orientation With many sound bars positioned below the TV, dialogue and vocals can often seem misplaced relevant to the people talking onscreen. To correct this problem, the YSP-5600 has a Dialogue Lift function (adjustable in three steps) that raises the reflecting beams from the array speakers to the proper height for accurate onscreen dialogue. Enjoy sounds and images that are perfectly aligned, just as in a movie theater. Support for the Latest Surround Format, Dolby Atmos Enter a new world of sound with Dolby Atmos. It transports you from an ordinary moment into an extraordinary experience with captivating, multidimensional sound that fills your room with amazing richness and depth. Music, people, and objects come alive in breathtaking detail and flow in precise choreography all around you, making you feel like you are truly there. The combination of Dolby Atmos and the YSP-5600 will fill the room with multidimensional sound that makes you feel as if you are right in the middle of the story unfolding on the screen. Support for the Latest Surround Format, DTS:X DTS:X is the next generation object-based, multi-dimensional audio technology from DTS. Unbound from channels, DTS:X conveys the fluid movement of sound to create an incredibly rich, realistic and immersive soundscape - in front of, behind, beside and above the audience - more accurately than ever before. The combination of DTS:X and the YSP-5600 will fill the room with multidimensional sound that makes you feel as if you are right in the middle of the story unfolding on the screen. DTS:X playback capability will be available via a future firmware update. Supports the Exclusive Yamaha CINEMA DSP 3D Mode Yamaha’s original CINEMA DSP 3D Mode adds an expansive height direction to the sound field, creating a rich surround space. The YSP-5600 supports this feature by using special array speakers to create vertical beams. You can enjoy the feeling of a live performance with standard sound formats, and combine this effect with Dolby Atmos or DTS:X to enjoy a more natural expansion of the 3D surround sound. Choose One of Four Listening Modes to Match Your Scenario The YSP-5600 is equipped with four listening modes: 3D Surround, which commands five horizontal beams and two vertical beams to recreate the equivalent of up to a 7.1.2-channel three-dimensional sound field; Surround, which uses five horizontal beams to perform normal 5.1-channel surround playback; Stereo, which uses a special vertical beam speaker as a tweeter to produce high sound quality 2-channel stereo from audio sources; and Target Playback mode, which aims monaural sound clearly to a precise location in the room. Easy Sound Calibration for Your Room The YSP-5600 employs IntelliBeam automatic sound optimization using the supplied microphone for the best performance in your listening environment. This also includes setting the position of sound beams directed at the ceiling. Achieve highly accurate and impressive sound field reproduction. MusicCast MusicCast makes it easy to bring music to every room in your home wirelessly with playback controlled by a simple app. Start with a MusicCast Sound Bar then add a MusicCast capable AV receiver in your main entertainment room for the ultimate home theater experience, next add MusicCast Wireless Speakers or Hi-Fi components in other rooms wirelessly. Subwoofer and wireless transmission kit sold separately. See accessories for details.